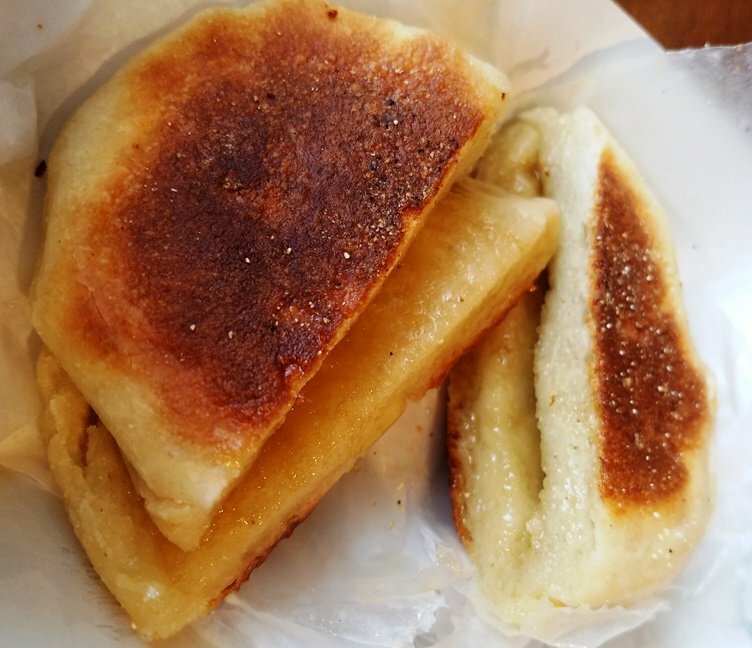 First Take: Get Your MuffOn at Michael’s English Muffins in Raleigh! If I say the word “English Muffin” what comes to mind? For me, it’s a small white and orange cardboard tray swaddled in plastic wrap, holding a half-dozen browned doughy discs! And in all honesty, I didn’t quite understand how English muffins were truly made. 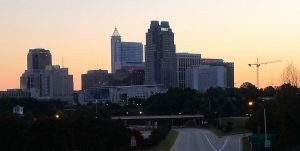 So I admit that I was curious when I heard about Michael’s English Muffins in Raleigh. Opened at the end of January, Michael’s is doing artisanal English Muffins and supplies their baked treats to higher end Triangle restaurants like Royale, Hummingbird and the Counting House in Durham. Some of their pictures on social media got my attention so it was time to take a trip up north to get my muffins on! 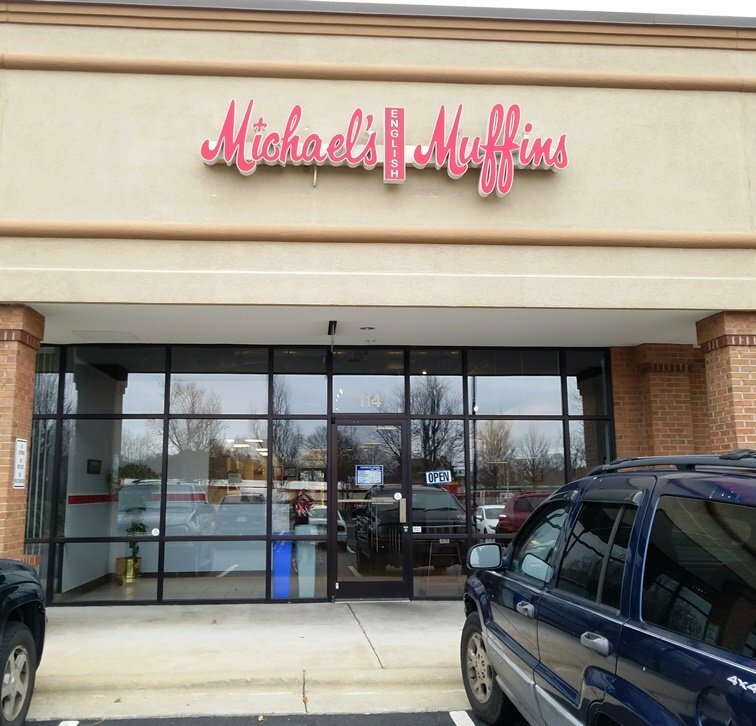 Located conveniently in N. Raleigh, Michael’s English Muffin is set in a small storefront behind the hustle and bustle of Capital Boulevard (behind Take 5 Oil Change). 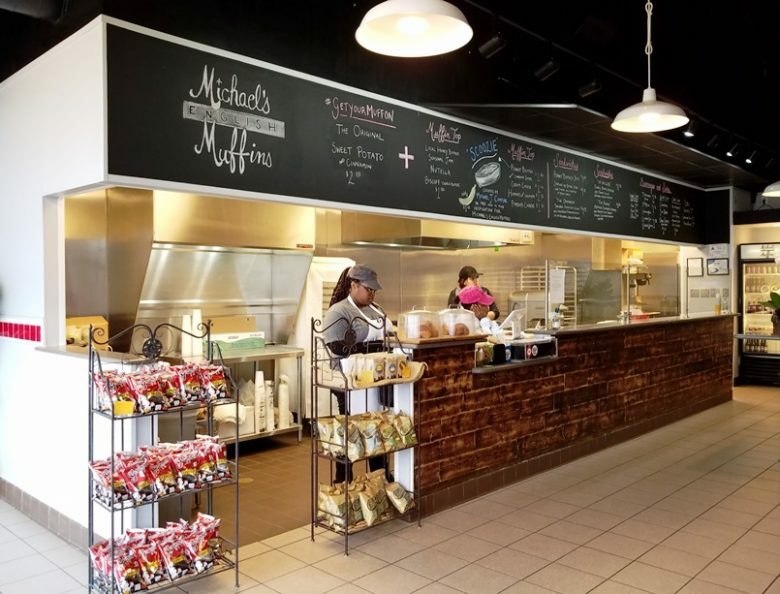 The plaza looks newer and inside, Michael’s English Muffins has a quick-serve cafe style set up with an order counter to the left, communal dining bar running down the middle and a couple of small 4-tops against the right-hand wall. 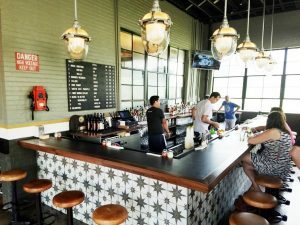 A chalkboard menu over the service area lists off the items on their short menu of muffin tops (muffins with a spread) along with a handful of sandwiches. A refrigerated case with drinks and some racks of chips round out the rest of the menu for Michael’s English Muffins, very simple! I immediately spy a lady tending to a griddle of puffy, browned muffins to the side. They look vaguely similar to what you might find at Teeters but WAY puffier, fluffier, taller and bigger. 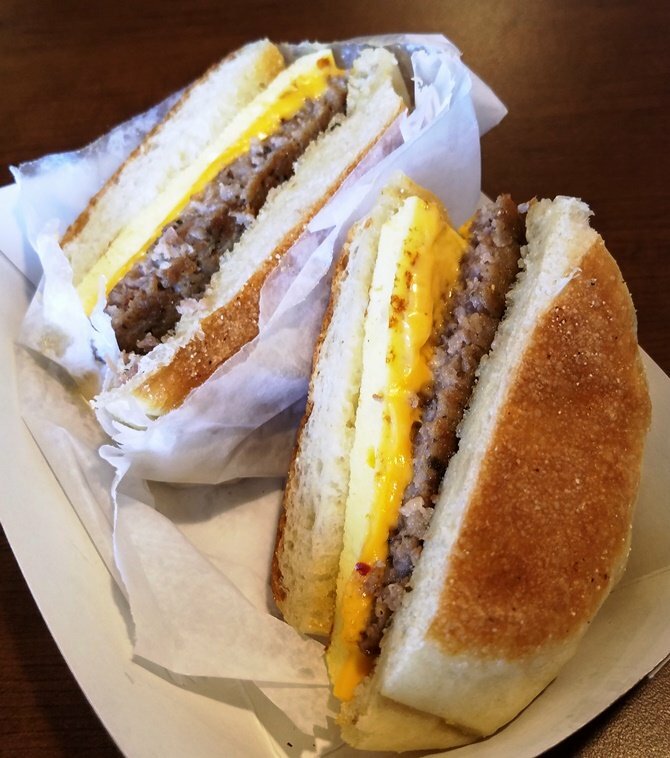 For my mid-day snack I order up a basic muffin top with honey butter along with their sausage, egg and American cheese sandwich! 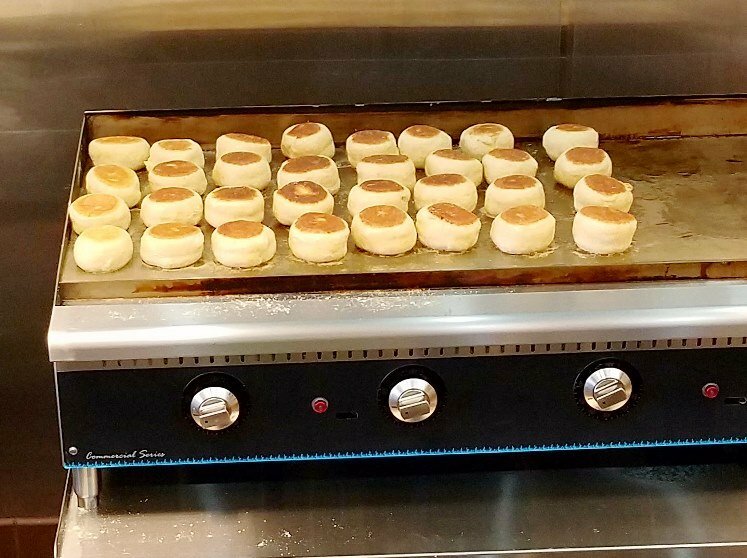 The muffins on the griddle are just finishing up, so a 10 minute wait for my order seems worthwhile to get it hot and fresh. About 15 minutes later, my meal is brought to the table. I bite into the bare muffin with honey-butter to get a feel for things. Michael’s English Muffins are certainly different than what I’ve eaten before. 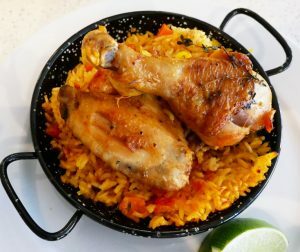 The bottom is super-crispy and crunchy while the insides are tender with a leavened texture. The muffin is thick without being too dense and there’s some elasticity and chew to it all. Like the muffins you get at the grocery store, the bottoms are dotted with specks of farina which prevents the bottoms from sticking.